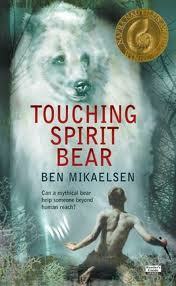 My son read Touching Spirit Bear for his sixth grade English class. He loved the book as did many of his classmates. I took this feedback and put the book on my library shelves in the middle school section. It was checked out almost immediately by a sixth grader. He hasn’t given it back to me yet. 🙂 He has renewed it for three weeks and has read the book three times. I was so impressed with the feedback, I read the book, too. Touching Spirit Bear is at times brutal, beginning with a frank recounting of Cole Matthew’s violent assault of a fellow classmate, Peter Driscal. Cole’s attack results in very serious injuries for Peter. The injuries are so severe that Cole could be tried as an adult and sent to prison. Cole is given an option by an Indian parole officer named Garvey to take part in Circle Justice, a Native American criminal justice technique where a circle of concerned citizens and those involved in the crime, victims and perpetrators, participate in a circle to decide how best the perpetrator can pay for his or her crime and begin a healing process. Cole’s circle includes his victim Peter, Peter’s family, Peter’s attorney, Cole and his abusive father and his alcoholic mother, his parole officer Garvey, a Tlingit tribe elder named Edwin, and members of the community join together to find a way for Cole to pay for his crime without going to prison. They decide to banish Cole to a remote Alaskan island where he will live by himself for a year under the watch of an Tlingit Indian elder. Garvey tells Cole about the Spirit Bear, a rare American Black Bear that is white and is generally found near British Columbia. Although it is rare to find a spirit bear as far North as Cole’s island, Cole sees a spirit bear within his first few days on the island. 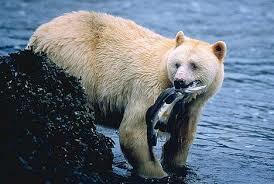 His encounter with the bear will change the direction of Cole’s life, both physically and mentally. This book really moved me. Cole is a hard character to like. His anger and arrogance are extreme. I was touched by the dedication and honesty of the two men, Garvey and Edgar, who commit themselves to helping Cole understand the severity of his crime and that the way to rehabilitate himself is through helping his victim recover. I was also moved by Cole’s connection to the spirit bear, the natural world and the Native American traditions Garvey and Edgar taught him. I think this is great book for middle school readers. The author’s note talks about the effectiveness of Circle Justice, now being used in some cities instead of jail time. One of the things I most love to do is introduce my first graders to different animals. This year, I’ve added two elements, some geography and, if I’m lucky, a fiction picture book. This lesson worked really well. To start the lesson, I have us all get on our imaginary airplane. Students all know that they need to buckle their seat belts. “One, Two, Three, Click!”. Then, we decide where we’re going, in this case, the deserts of Africa. We put out our wings and th en fly. Africa is exactly 10 seconds from Oakland, CA by library plane. We count it out, land, and unclick our seat belts. Then, we’re off to the deserts of Africa. To learn about the desert, I use the great Blast Off Reader series, published by Bellwether Media, called “Learning About the Earth”. 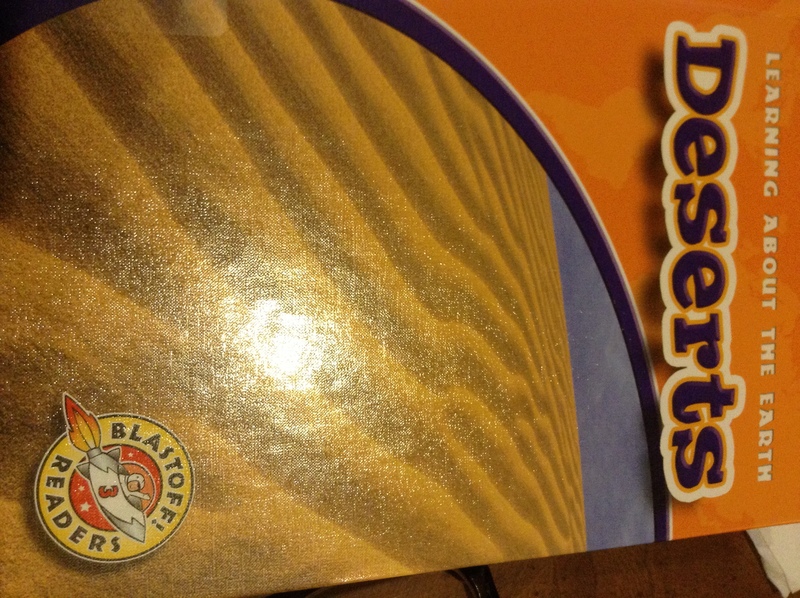 This series is written a the Level 3, Early Fluent, level, so to make the lesson move along, I only read a few pages with key facts about deserts. It was fun for me to learn that Antarctica is a cold desert. We went to the desert, because Meerkats live in the desert as well as grass lands. I have another Blast Off Readers series called “Animal Safari” that I love to use. It’s written at the emergent reader level, so there are just enough facts to pull out for first graders to digest in five minutes. I combine all the animal facts with some type of hand signal. The kids all grasp these hand signals really quickly and retain the facts from week to week. I love asking them about each animal we learn about at the end of the school year. So here we are in the African desert, learning about Meerkats. 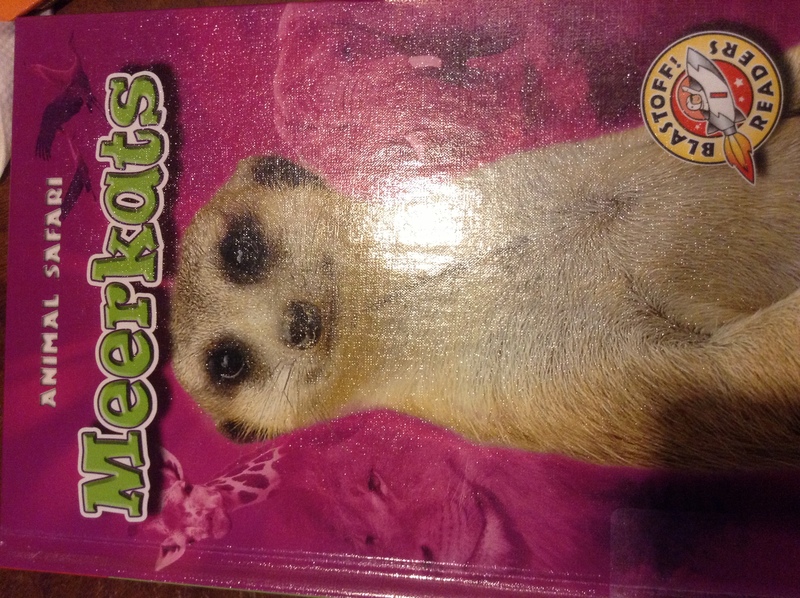 We learn that Meerkats are mammals. We make circles with our hands and put them to our eyes to make the rings around Meerkats eyes. We turned into a mob of Meerkats. Then, we ate scorpions, dug burrows and when our Meerkat sentry spotted a lion (their teacher), we all dive into our burrows. 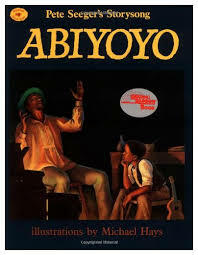 We finish our trip to Africa with a favorite book at our school, Abiyoyo, Pete Seeger’s Storysong retelling a South African folktale about a father and son who are ostracized by a village because of their music and magic and then save the village from a giant called Abiyoyo. We sing the simple Abiyoyo tune at the end. Then, it’s sadly time for my students to leave Africa and the world of Meerkats. We put our our seat belts, hold out our wings and take the 10 second trip home to Oakland. This book hit a home run with my second graders. It’s a story of friendship and loyalty. I absolutely love the suspense that kept my students on the edge of their seats. My students were engaged from the moment I started reading. This is a great book with wonderful illustrations, and is one of my favorites of the new picture books I bought for this year. Wilfred is a (very cute) big hairy giant who wants a friend. He goes to a village and scares everyone, except a brave boy. He and the brave boy become fast friends. However, the village is a village of bald people who covet the big hairy giant’s fur. They ask Wilfred for his fur, and good-hearted Wilfred gives it to them. Now, freezing in the cold winter, Wilfred can’t come out and play. He has to stay in his cave to keep warm by a fire. The boy, searching for his friend, gets lost in a snow storm. Wilfred hears his cries and leaves his warm cave to try to save the boy. The villagers find Wilfred and the boy in the snow. Wilfred is wrapped around the boy, trying to keep him warm. 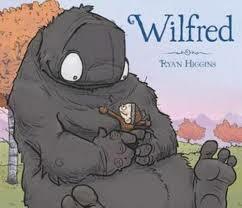 Seeing this incredible act of loyalty, they realize that Wilfred is a good giant who needs his fur back. You won’t regret buying this book. Enjoy. 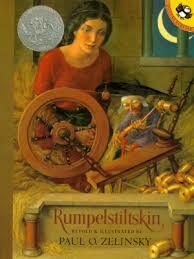 Rumpelstiltskin is a favorite Grimm’s fairytale. 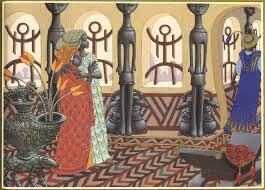 The Girl Who Spun Gold, by Virginia Hamilton retells the story in a West Indian setting. This refreshing version captivated my fourth graders not only because of Hamilton’s writing, but particularly because of Leo and Diane Dillon absolutely captivating, colorful illustrations. Hamilton read a version of this tale in West Indian dialect in 1899. While she loved the retelling, she found it hard for modern audiences to understand. So, she re-wrote it in more familiar language. The version is long and took longer than one class time to complete, but was well worth the time. Click here to see a lesson idea comparing two different retellings of the Rumplestiltskin story using this book. Here’s a lesson idea, contrasting two different retellings of a fairy tale, that worked really well with my fourth graders. I love the book The Girl Who Spun Gold, by Virginia Hamilton and wanted to pair it with the traditional telling of Rumplestiltskin. I used a very old copy of Rumplestiltskin that we had in our library. I wasn’t thrilled with this older book and ordered Paul Zelinsky’s version of the book after this lesson (winner of the 1987 Caldecott Honor). The illlustrations are full of vibrant color that are sure to attract students and compare nicely with Leo and Diane’s illustrations in The Girl Who Spun Gold. I took two class times to read Virginia Hamilton’s book, about 20 minutes, in all. I then read the traditional telling of the story. My students were jumping up to offer me similarities and differences between the two retellings of the story. It was a lot of fun to see them so excited. Next week, I’ll do a book talk and read the first couple of chapters of Rump: The True Story of Rumplestiltskin, a new book by Liesl Shurtliff, a fractured fairytale. It’s always nice to find a real winner for the pre-k set. 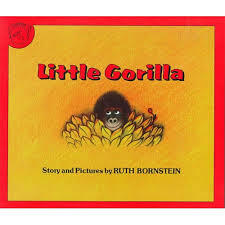 Little Gorilla is one of those affirming books that makes everyone, listener and reader feel good. This year, I’m trying to tie my picture books into our non-fiction texts as often as possible. Sometimes, it’s just tying to a book about the place where the story takes place, or facts about the animal involved, or maybe the climate or the season. For those of you looking for ideas for your own library class times, I hope this new part of my blog on Lesson ideas is helpful to you. Lots of my students don’t have the ability to travel outside Oakland, and I’m a geography buff. So I take every opportunity to introduce geography into my time with my students. The Lion and the Mouse is a great gateway book to talk about Africa, the African savanna and the animals that live there. I started with asking my students to name the seven continents. Then I focused them on Africa on our map. It’s also great to incorporate a globe to show students how far away places are from their home. Today, I used a wonderful book we just added to our library from the First Facts series on continents by Capstone Press. The book I used is called Spotlight on Africa. I took a few moments to sho w my students some pictures from the books and then turned to the page on Africa’s climates. This page shows a picture of desert, rain forest and the savanna. 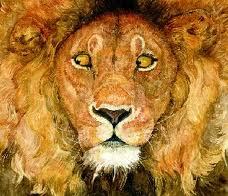 I then pulled out book on the African savanna called Here is the African Savanna. This book has a lot of repetition and is really meant for younger children, but it nicely goes through many of the animals that live on the African savanna and even talks about the acacia trees. I didn’t read everything on the page, because I wanted to focus the students on the different animals they might see on the savanna. Altogether, we only spent about five or 10 minutes looking at a map, the book on Africa and the pages of the Savanna book. We th en went on to, The Lion and the Mouse. I ask my students to “read” this book in silence. It is so beautifully illustrated. The lion’s and the mouse’s facial expressions are wonderful. I see my students telling themselves the story with their mouths moving. After they’ve finished “reading” this wordless book, I ask them to tell me the story.